A research team led by Professor Gao Chao of the Department of Polymer Science of China’s Zhejiang University in Hangzhou used a freeze-drying technique to create an aerogel – a “carbon sponge” – from a mix of graphene and carbon nanotubes. It is the world’s lightest material and it can be balanced on a blade of grass. It weighs just 0.16 kilograms per metre cubed. For comparison, a metre cubed of water weighs 1000 kg and a metre cubed of styrofoam weighs 75 kg. It is also less dense than air (less mass per volume). A metre cubed of air has a mass of 1.2 kg, graphene aerogel only 0.16 kg. The previous record-holder was an aerogel made of graphite, and weighed slightly more, 0.18 kg per cubic metre. Graphite is a carbon material made of sheets of carbon, one atom-thick. These sheets are stacked one on top of the other but can easily move relative to each other. Which is why graphite is used as pencil lead. As you write, the layers of carbon shear off, remaining on the page. Graphene is similar to graphite, in that it is made of a single sheet of carbon atoms. A single atom thick layer! One of the early methods of making graphene was peeling layers from graphite. As you can imagine, being one atom thick, it has a host of interesting properties. It is a very good conductor of electricity and it is incredibly tough. Aerogels are ultralight materials that are made by substituting the liquid component of a gel with a gas. They have very low density and thermal conductivity, making them exceptional insulators. Silica aerogel was first made in the 1930s and is currently the most commonly used. NASA uses it to insulate its Mars Rovers and its spacesuits. It has also been used to trap space dust on the Stardust NASA mission. Unsurprisingly, an aerogel made with graphene is super-light. 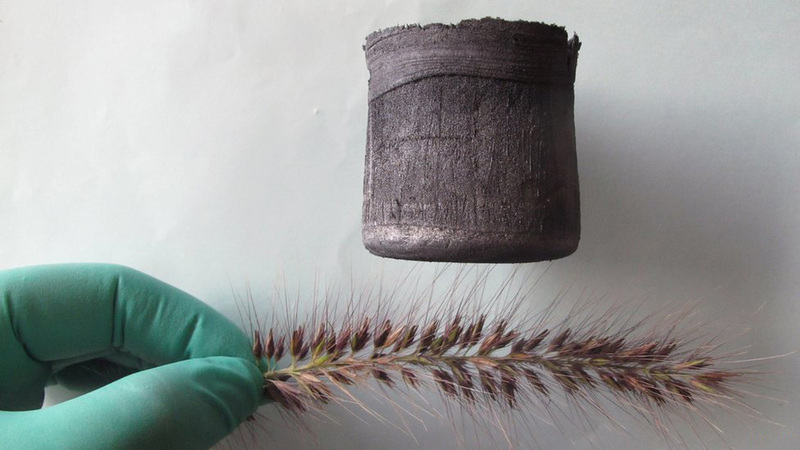 Here is a gallery of the graphene aerogel balanced on top of things. The freeze-drying technique used by the research team allows the manufacture of graphene aerogels of any shape. This graphene aerogel is very elastic and strong and bounces back into shape after being compressed. Since its structure allows it to absorb 900 times its weight at a fast rate, a proposed application is to mop up oil spills. After the oil has been absorbed by the aerogel it can be simply “squeezed” out, and the graphene aerogel can be reused. “Maybe one day when oil spill occurs, we can scatter them on the sea and absorb the oil quickly. Due to its elasticity, both the oil absorbed and the aerogel can be recycled.” said Professor Gao Chao. Other proposed applications of this new material are as a catalytic carrier, efficient composite or as a phase-change energy storage insulator.